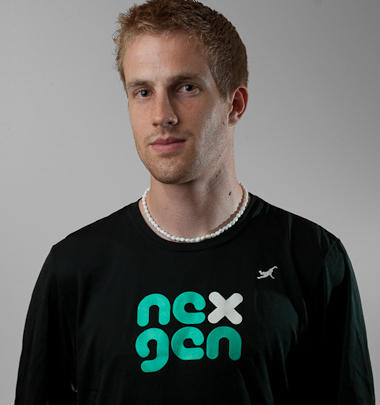 Ollie Gordon joins the NexGen Ultimate Tour from the United Kingdom where he attends the University of Exeter. He started playing Ultimate in 2004 when he chanced upon a local tournament in his hometown of Glastonbury, England. Less than a year later he was selected to the Great Britain Junior National team for the first of two times – 2004 and 2006. In his fifth and final year at Exeter, Gordon captained the club team Uriel to a 4th place finish at U.K. College Nationals. He holds Full University Colors for contribution to University Sport and was named a finalist for Exeter’s 2010/11 Sportsman of the Year Award. Gordon played competitive club ultimate with Devon (2007-2010) and now plays with Manchester-based Chevron Action Flash (2011-present). Gordon represented Great Britain last summer at the inaugural U23 World Championships in Italy and he has been selected to the 2011-2012 Great Britain Open national team that will represent his country at the 2012 World Games. Gordon will graduate this summer from the University of Exeter with a Master of Science in Sport and Health Science. He earned his Bachelor of Science in Exercise and Sports Science from Exeter in 2009. -Gordon is a grade 8 violinist – the highest level awarded by The Associated Board of the Royal Schools of Music.